I had a spare Navwar Admiral Gorshkov. I also wasn’t sure what approach to take with the sea bases and painting the 1/3000th ships, it has been a while and my painting techniques have been changing over that period. 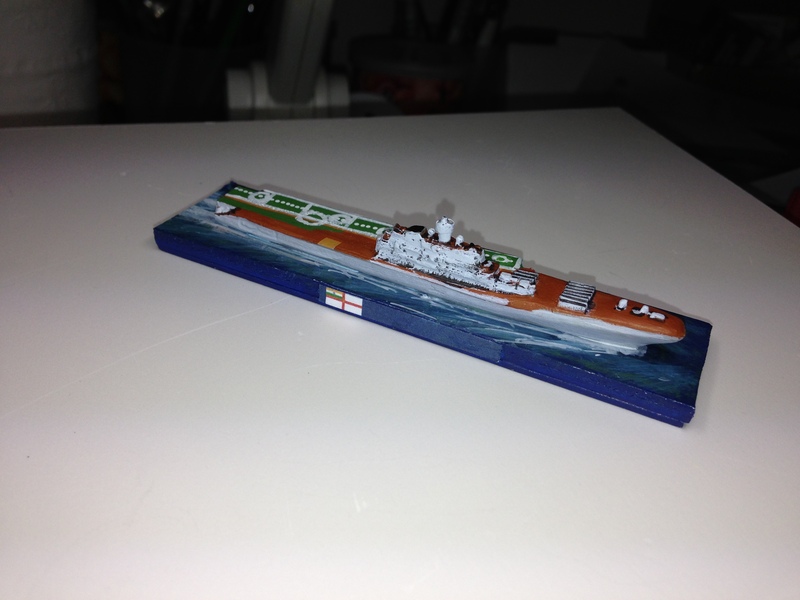 I recently painted 1/6000th scale ships and wondered if I could apply the same principles to the 1/3000th. I also was wondering how to do deal with the sea base as these ships do not have a sea base under them. So many questions. The solution? A prototype or as we like to consider it now, the flashiest fridge magnet Thomo has ever made. I had already glued the model to the plastic base I am trying currently, and yes, I over ordered when I put that Navwar order in before. I then undercoated in white. Next step was painting the base Vallejo Prussian Blue (a step I will drop next time). I then painting Citadel’s old Regal Blue and used a very diluted Goblin Green across that. A very diluted Ice Blue was then washed across the base followed by some white when the blue was still wet. I should note at this point as well that I had tried using Vallejo’s Water Effects to model a sea base – mucking around with another carrier surplus to needs. In the words of twitter – #fail! The flight deck was then painted. I used two lighter shades than appeared in the photographs I had seen of the vessel as I am fairly sure they will darken a little more once the varnishing is done. The next step was to take a white paint pen and paint the deck markings on. These are a little dodgy but I am getting used to the pen and learning a little patience – like wait for it to dry, shake it frequently and be happy when you need to redraw a line three times to get the white sufficiently opaque on the model. Superstructure was painted and washed in black ink. It was then dry (really wet) brushed with a very light grey. The missile silos were also touched up at this point. The last step was the black on the funnel top. Actually the detail on this model is a bit odd at the top of the superstructure but what the heck, it is a wargame model after all. A touch up of a couple of colours and then some white added to the wash around the bow. Voila! The Frank Gorshin … sorry, Admiral Gorshkov is ready for the table. 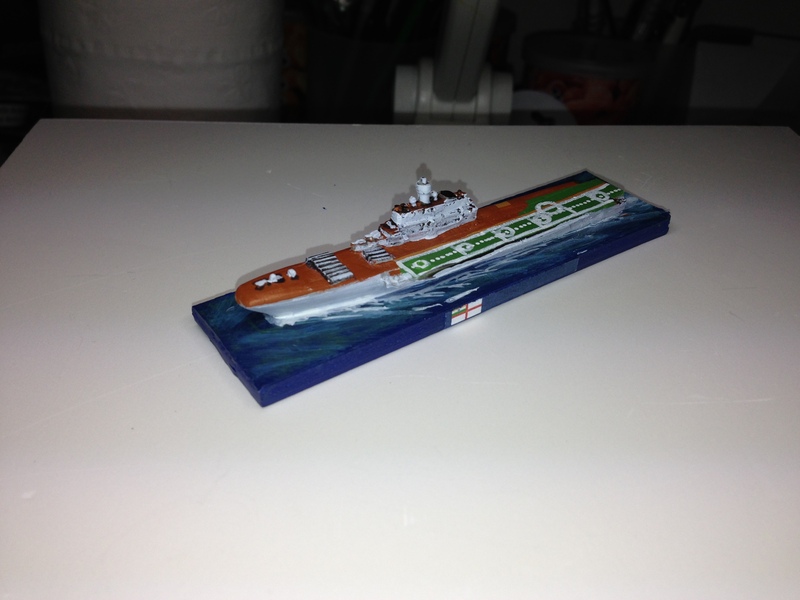 I think next time I will use a lighter more fluorescent green on the sea base. Hopefully I will get some time tomorrow to get out to Changi Naval Base and have a look at some ships. 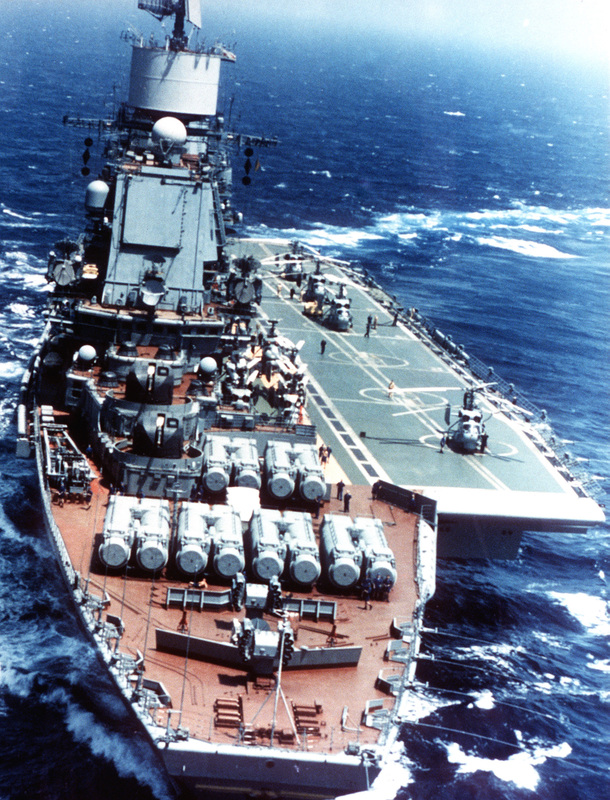 I’ll leave you with a picture of the real Admiral Gorshkov. Nice work. I wonder if I will get an Admiral Gorschkov in the Russian pack? Much better for visual effect when wargaming, is to put the ship on a clear acetate base. Then regardless of the colour underneath all the ships look to be on the same ocean! That’s how I do it these days. Yeah that was tempting too but I keep the nomadic nature of my lifestyle at the back of my head so I base for travelling these days – either one box full for specific games or tournaments, or many boxes full for moving from here to there permanently. I love these ships, mine is 1/700.